Why drink out of an ordinary mug? Add a photo & text to serve up a totally fun cup of coffee! 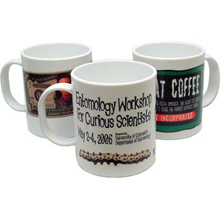 11 oz ceramic mugs - microwave and dishwasher safe. 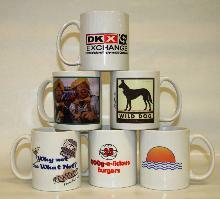 These mugs make great promotional giveaways or lovely personalized gifts. PolySub® Mug, 11oz, Plastic, White. PolySub Mugs are made of a specially formulated polymer that is dishwasher and microwave safe. Safe for use at the beach, swimming pool, and any other place where breaking a ceramic or glass mug would cause a safety hazard. 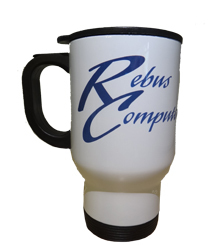 This polymer mug is a generous 15oz, with formed lid is made in the USA, dishwasher and microwave safe, lightweight and impact resistant. 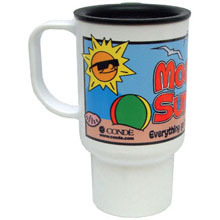 Safe for use at the beach, swimming pool, and any other place where breaking a ceramic or glass mug would cause a safety hazard. This mug has a small base so that it will fit right into your cars cup holder. Perfect for the coffee or tea lover in your life. Our mug not only holds a favorite hot beverage-but will be a daily reminder of you!. That means your message will join them each morning and whenever they need their caffeine fix. This mug has a small base so that it will fit right into your car's cup holder.